Honeyman, Keppie & Mackintosh made major alterations to a city-centre tenement building in 1903, reconstructing the Sauchiehall Street elevation and giving it a striking roughcast finish, and creating distinctive decorative interiors for client Miss Catherine (Kate) Cranston. In 1906, decoration and alterations to extend services in the basement were carried out. In 1916–17, the Dug Out tea room was created in an adjoining basement. The Sauchiehall Street elevation and mezzanine and first-floor tea rooms were reconstructed in 1979–80. 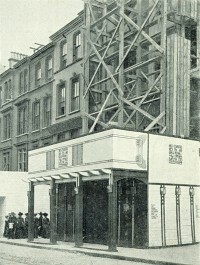 Authorship: Mackintosh was named as architect in a Glasgow newspaper article marking the opening. A celebratory article written by Fernando Agnoletti was published in a German journal in 1905. Mackintosh commented on Miss Cranston's satisfaction with his work in letters to Hermann Muthesius in 1903. Alternative names: Miss Cranston's Lunch and Tea Rooms, Sauchiehall Street, The Kensington, Kensington Tearooms.